Proponiamo qui di seguito un articolo apparso sul quotidiano in lingua araba pubblicato a Londra, al Quds al Arabi, lo scorso 23 dicembre a firma di Samir Seifan, noto economista siriano che a cavallo tra la fine degli anni ’90 e l’inizio degli anni 2000 ha fatto parte del circolo dei “tecnocrati illuminati” scelti dall’allora raìs in pectore e poi neo presidente Bashar al Asad per guidare il processo di riforma del Paese. Seifan, da anni docente alla St. Andrews University, conosce dunque da vicino la mentalità del presidente Asad e del suo più ristretto entourage. Nonostante sia un po’ datato, l’articolo è stato tradotto in inglese dai giovani volontari del gruppo dei Traduttori siriani liberi (al-Mutarjimūn al-suriyyūn al-ahrār, المترجمون السوريون الأحرار). 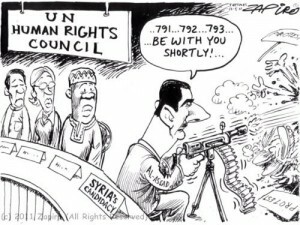 Before the Arab Spring began, Bashar Al Assad was confident that no Syrian would dare to challenge his regime. He was used to viewing the authority of the Al Assad family as infinitely absolute. He is the son of the Defense Minister whose army was defeated by Israel in 1967, and instead of being held accountable, as the case in democratic countries ruled by institutions, he led a coup and seized power completely in 1970. He imprisoned his comrades who opposed him until they died in prison. He used to jail his opponents for decades just for initiating a political entity or issuing a statement. He prevented the formation of any political or non-political organizations, allowing only the creation of hollow and loyal ones. He fragmented all powers in society, such that it became paralyzed unable to carry out any collective activity. So, nothing was left in Syria that can threaten Al Assad. Bashar Al Assad continued his Father’s approach; he never took the people into account, expecting them to clap for him always. Why not and he is the son of Hafez Al Assad who had labeled his ‘semi-sacred’ self with titles like “the Father Leader”, “the Eternal Leader” and the “Leader for Ever”, and enforced a pattern of viewing him as a sacred god that nobody can touch or approach, and made his power a taboo subject. Bashar Al Assad watched how his father was able to make Syria a farm of his own, and how he was able to bequeath him the presidency, and how the constitution was amended in a clowning session of the Parliament without any opposition from Syrians. He watched the queues of the lowly and the opportunist gathering submissively around him. As a result of this, Bashar was not thinking straight, he could have never imagined the existence of a protester against him in the street; such image is much bigger than his mind could tolerate. He was convinced that the people have to love him, and those who did not had to fear him and believe the support rallies that are orchestrated by the security apparatus and government institutions. He was confident that the Syrian people do not have the ability to do anything against him, and if someone dared to demonstrate against him, then undoubtedly he/she deserves death. He was convinced that a couple of bullets were enough to disperse any opposing demonstration no matter how massive it is. This is his mentality and his whole regime’s mentality. When the Arab Spring erupted in Tunisia and then moved to Egypt, Bashar was confidently stating that Syria is far from such movements, because Syria is the “country of resistance”. So when the Syrian revolution started in March 2011, he did not believe that such thing could happen in Syrian with such momentum; therefore, he was repeating every month that the crisis in Syria “has finished” and “the problem is behind him”. But following each of these statements, he discovers the worst is yet to come, and in spite of the continued failure of such expectations, he still lives in his illusion that things will come to end soon. The first option was the belief that the security apparatus is sufficient to deter the people, and that a few bullets can solve the problem as the regime has long history of conflict with the people, and this time is similar to others. The alternative was to resign to the facts and consequences of these historic events, and acknowledge the end of the one-party era, the one-color one-person regime, and the end of the practice of running the country as a private farm; and time is due to return power to the people and prepare Syria for a peaceful and smooth transition of power to a civil and democratic state. Then the Syrian people would remember him for that and forget the past. Bashar could not even consider the second choice, he chose the first one and clang to power whatever the price would be. He prepared his plans to confront the demonstrations. Thus his regime’s reaction was not simultaneous or spontaneous when his cousin, the head of the Political Security in Dara’a, officer Atef Najeeb, gave his command to open fire on the demonstrators who took to streets demanding the release of their children who had been arrested and tortured by him, killing six protestors. But the frightening, unexpected shock was that this time was like no other before. The protests continued, and the Syrian people broke the barrier of fear. What is more, in spite of the increasing use of bullets, arrests, and torture, the demonstrations grew to include new areas and participants. Al Assad tried to grant Syrians some tangible privileges, and tried holding meetings with delegation representing locals, but nothing could work for him. 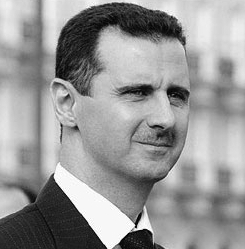 He tried launching a program of political and economic reform, and made a range of concessions that under normal circumstances he would have never thought of, like the repeal of emergency law, issuance of laws governing political parties and demonstrations, calling for a national dialogue, and allowing the opposition to hold two meetings in Syria, thinking all along that that was enough to satisfy the majority of people. However all of these initiatives could not stop the demonstrations because they did not include the return of power to the people and Syria’s transition to a democratic and pluralistic regime in which power is circulated. Despite everything that had happened, he did not say that he will not nominate himself for presidency in 2014 or guarantee that the 2014 presidential elections would be free and not a forged referendum to approve him, the only candidate, as has happened before. Al Assad and his regime invented the narrative of infiltrators, foreign conspiracy, and salafi emirates in order to spread confusion and justify killing the demonstrators. He sought since the early days of the revolt to militarize the uprising to and push it towards an armed battle where he is the stronger, and to justify his crackdowns, as long as he was reassured that there would be no action by the international community to hold him responsible. So far, Bashar could not comprehend what is going on. He got confused and uncertain when the policies of appeasement failed, and so he had no other choice but to continue with his security solution, and drag the army into a dirty mission to face and suppress the demonstrators. He expanded his security solution and aimed it against the whole region. The first threat to the security of Israel was made by his cousin Rami Makhlouf, Al Assad family’s main businessman, and then Al Assad himself threatened the whole region if any action was taken against his regime. The regime is trying to use a tactic it used before during what is known as “Brotherhoods Events” in 1979-1982 where a brutal crackdown on one area was used to intimidate all other areas. But such tactic has not worked this time, neither in the city of Dara’a, nor in the cities of Homs, Idlib, Hama and Der Al Zour, or in anywhere else. Al Assad used the logic that “a crisis that could not be resolved by violence, can be resolved by more violence”. The result was that the demonstrations transformed from weekly to daily events, and the killing of protestors occurred now on a daily, rather than weekly, basis and some demonstrators resorted to carrying weapons in a very predictable reaction. Till this day, Al Assad is determined to go forward “in this nail biting game”, betting on that the people in streets would get tired. Till now, and despite all the disasters, Al Assad is still not prepared to even think about reproducing a regime similar to Mubarak’s in Egypt which allowed plurality of parties under the control of the security apparatus to ensure his re-election as an absolute president of the Syrian Republic for infinitely. It is astonishing that Al-Assad still lives in an illusion of the possibility to turn back the clock. Because he felt surrounded and after Russia began to change its stand, on which he was counting significantly, he was forced to sign the Arab League initiative after rejection, stalling and maneuvering for another two months. He is preparing now to get the Arab League lost in the maze of implementing its initiative on the ground, and prepares to fabricate events in order to mislead the Arab League and confuse it, in the hope of transforming the whole problem, from a matter of a people fighting to reclaim their freedom, to concentrating on partial and procedural issues related to implementing the Arab plan which includes a peaceful transition of power within a defined short period, and with a clear mechanism. The problem in Syria is not in accepting dialogue with the Al Assad regime, or the attitude towards his reform program, or the existence of infiltrators, or an Arab and foreign conspiracy, or the existence of armed men whose numbers increased a lot as a result of the regime’s brutal crackdown on peaceful demonstrators. These are just ramifications or side effects of the major problem which is that Bashar Al Assad has not comprehended what is going on around him, and he is still refusing to hand over the power to his people, and he is still sinking in his illusions, and still believes that he can retain the power in spite of all what has happened, what will happen, and what might happen. This is what would cause disastrous consequences to Syria unless he is deterred effectively. Di Seifan si legga ad esempio il libello: Syria on the Path to Economic Reform (St. Andrews Papers on Contemporary Syria) del 2010.